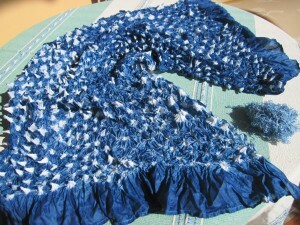 Purchased from Maiwa Handprints on Granville Island, Vancouver, BC was this lovely undyed silk shibori tied shawl. 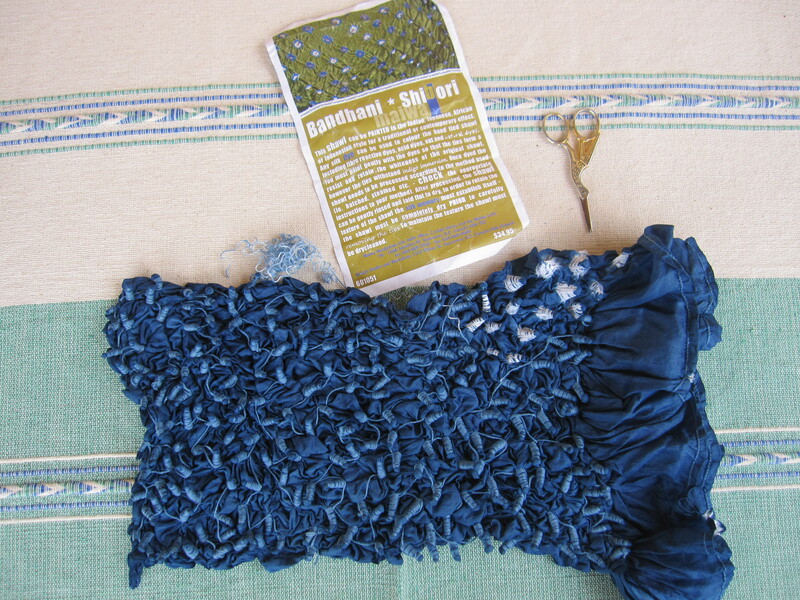 During the past summer I dyed the shawl in successive indigo vats knowing that when the shawl was dry, it would look lighter. I brought the shawl to Mexico with me and started to un-do all the wrappings and slip knots holding the threads in place. You can see where I started in the top right hand corner. After the ties were removed the above photo shows the finished product. The shawl had originally been folded a couple of times and then the layers of fabric were all tied together in the knots. This shows why it looks different in different areas. Apparently to retain the texture the shawl should be dry cleaned. I should also mention that I am happy to use the leftover tie threads, which appear to be cotton, in my tapestries. The threads have a great variation in the shades of blue. A wonderful by-product.